Posted by randydeutsch in books, infrastructure, technology. 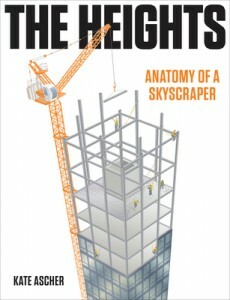 Here are 17 very good reasons to read Kate Ascher’s new book, The Heights: Anatomy of a Skyscraper. 1. You might recall Ascher is the author of The Works: Anatomy of a City, the book that made city infrastructure alluring, visually appealing and fascinating. 3. As with her previous book, The Works, the chapters are divided into sections but are presented in a building “directory.” Here, the sections are represented by elevator buttons, in reverse order, with the later chapters at the top and the intro at the bottom of the page; the section titles (“dreaming it,” “building it”) are helpful and especially, clever. 4. The pages have lots of white space – not cramped with info the way some reference books are (that understandably remain on the shelf.) Here the white space allows you to make connections, between the words and images, and between the images. It also frees your mind up, allowing it to dream up ideas of your own. 5. At first blush, the graphics in particular may remind you of those reference books in the 00’s section of the Dewey decimal system in the library. Ignore this association: it is false. The book opens with an acknowledgment of the current economy, placing the subject firmly in the present without dating it. And that perhaps is the strength not only of the text, but the nearly-realistic images: they serve to make the contents of the book feel both timely and timeless. Hard to do – this book pulls it off. 6. The range of skyscrapers that are studied and analyzed is mindboggling. Sure, there are the usual subjects – but the most contemporary examples of this building type are also represented. How are these services-considered essential, but largely taken for granted- possible in such a complex structure? What does it really take to sustain human life at such enormous heights? How do skyscrapers sway in the wind, and why exactly is that a good idea? How can a modern elevator be as fast as an airplane? Are skyscrapers in Asia safer than those in the United States, and if so, why? Have new safeguards been designed to protect skyscrapers from terrorism? What happens when the power goes out in a building so tall? Why are all modern skyscrapers seemingly made of glass, and how can that be safe? How do skyscrapers age, and how can they be maintained over decades of habitation? 8. According to an interview, Ascher says that The Works: Anatomy of a City was inspired by David Macaulay’s The Way Things Work. You can see how the Heights might have been inspired by another David Macaulay masterpiece, the 1987 book, Unbuilding. 9. Compare The Heights with another work on a similar subject: Skyscraper: The Making of a Building by Karl Sabbagh which worked primarily because it told the story of a single skyscraper, at a particular time and place, and was the subject of a PBS series. The Height’s strength is that it provides both a more general overview while at the same time delving more deeply into specific topics related to the building type. 10. I was a skyscraper designer for many years and taught the subject in an architecture masters university program. The bottom line: Ascher knows her stuff. 12. Reading the book about high-rises is a lot less risky than trying to design or build one. Especially when you can read an excerpt of the book here. 15. The author, Kate Ascher, is an urban planning and development expert – not a structural engineer OR a journalist. Ascher has a Ph.D. in government from the London School of Economics and a B.A. in political science from Brown University. You are benefitting from a big-picture view of the skyscraper that helps the reader see how every part of the building is interrelated. 16. In The Heights Ascher talks about the many issues that engineers must take into account when delivering a tall building. Had skyscraper engineer, William J. LeMessurier, the engineer at the center of the fascinating case study (“What’s an engineer’s worst nightmare?”) The_59_Story_Crisis, had a copy of The Heights – maybe the Citicorp near-fiasco never happened? 17. Curious about what prevents you from falling to your death in an elevator? There’s a fascinating chapter on elevator safety. Even if you suffer from vertigo or have a fear of heights, read Kate Ascher’s new book, The Heights: Anatomy of a Skyscraper. It’s a whole lot safer than building one and a lot more informative and fun.